Fancy a nice big catch? A rewarding experience full of anticipation, deep sea fishing is one of the most intriguing adventures that the UAE water has to offer. Boasting of over 500 marine species, the Gulf water houses a record catch, including blacktip sharks, groupers, sailfish or even parrotfish. In fact, Dubai itself is considered to be one of the biggest sailfish destinations in the world, playing host to numerous renowned mariners and sea fishing enthusiasts in the Middle East. This is more so because, historically, fishing was a part of the local culture -- a source of food and, therefore, Emiratis have always been at heart with the sea. Fishing is a unique art -- you need to master the technique. 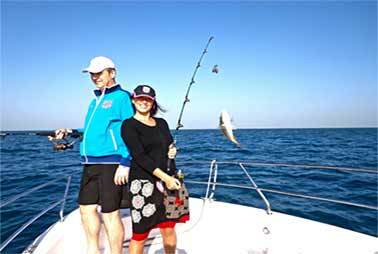 Some of the most popular techniques to get a great catch, and often used by fishermen in the UAE, are angling (using a hook), netting and trapping. However, for the ultimate catch, you definitely need to go deep sea fishing -- a simple adventure that lures tourists from all corners of the globe and the Middle East. So get onto a boat and sail deeper into the sea and you will land up with a super catch that will include not just kingfish, groupers, sailfish, tuna, dorado or queen fish, but also cobia, trevallies, snappers and even barracudas! However, first things first, you need a fishing licence to experience this wonderful journey. License is free in Dubai and you can apply online on the Dubai Municipality portal (https://portal.dm.gov.ae/UM/defaultopen.jsp). However, in Abu Dhabi, it will cost you around Dh30 for a week. But hold on -- the good news is that if you go deep sea fishing with a tour company, the company will have a fishing license and will cover your entire trip. Moreover, the tour company will also provide you with fishing equipment and, if you are a beginner, its instructors will teach you how to fish. Many tour companies have yachts and fishing boats designed to cater to corporate team buildings and all types of private groups. They take you to numerous spots around the Emirates -- Dubai, Abu Dhabi or Fujairah. So, whether you prefer offshore or deep sea fishing, if you are a fan of big game fishing or night fishing or if you want to get some sun, sea and sand along with a sumptuous catch, definitely go fishing! In fact, you can even cook your catch on the yacht at the end of the day. So what are you waiting for?